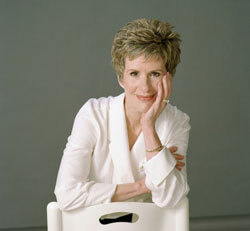 I slipped into Auditorium A1 just in time to hear Susan Elizabeth Phillips discussing how she began her writing career. I’ve both known and been a reader fan of Susan since her third book, Glitter Baby, which was a big women’s fiction contemporary book that launched her career. Her newest hardcover novel, Call Me Irresistible, is her twentieth book. So I listened with interest as she recalled how her wonderful writing career actually began. It’s encouraging for aspiring writers that Susan’s story is similar to many others: a young mother whose talk with a friend about favorite books led to the quick decision to write a book together, although neither had any publishing experience. Of course, nothing is ever as easy as it seems and Susan and her friend soon discovered this. However, they kept making time to write until an indirect chance conversation led to an early read by an New York editor, request for material and a surprising contract for the pair’s first historical novel. When her friend moved to another state, Susan continued writing solo and the rest is history: a bestselling writing career spanning thirty years. Call Me Irresistible is her newest hardcover novel and pairs secondary characters from previous books—Ted Beaudine aka “little Teddy” with Lucy Jorik, much to readers enjoyment. Time management: Use a timer for whatever time you commit to write, stop timer whenever there’s an interruption, hit it to continue to write and use this stop/start timer method for however long it takes you to fulfill the time you set. Write for one person: yourself. Protect the Work: Do whatever you have to do to protect your writing/ work, depending on who you are. For instance, not reading reviews or online comments. 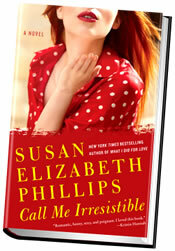 After autographing my copy of Call Me Irresistible, Susan left to catch a plane back to Illinois. She left me energized and glad I’d made the trip to see her. 1. Drop a comment below. NOTE: One entry per person. Winners will be contacted by their email too (so make sure your email address is correct)…Good Luck! Comment entries will be accepted until March 24th, 2011. Winners will be selected randomly via mysql query from the comment table and announced Friday the 25th. Thank you for the post, Sally. I love the tips. The best advise ever “protect your work”, don’t read reviews or comments!! Great post Sally! It’s so important to remember we all start, for the most part, in the same place! Hey, Mini-Me! Susan’s story reminded me of my daughter, who just started writing in the last year with a good friend. Susan’s very inspiring…glad you enjoyed. You’re such a sweetheart that I’m glad you found replying easy as I would have missed hearing from you.